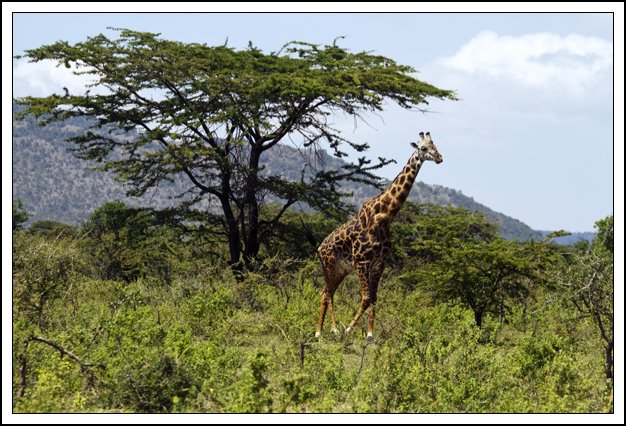 A Masai giraffe in front of a flat topped acacia. Photo by David Lansing. We’ve fallen into a pleasant routine here in the Mara. We try to gather in the dining tent by 6:30 for a quick breakfast of fruit and coffee (Calvin would like us to be up by 5:30 but it’s just not going to happen). Early morning is the best time of day. The air is cool and fresh, the sky alive with chattering starlings and weavers and mourning doves. It is the cooing of mourning doves that, for me, is the soundtrack of Africa. We might spend three or four hours looking for game, always with a specific species in mind, yet we are easily distracted. In search of a leopard in a tree we instead come across three or four Masai giraffe browsing on a flat topped acacia or cautiously sipping at a water hole, their ridiculous legs splayed out in all directions, like a dog on an ice-skating rink, which is when they’re most vulnerable to an attack by a lion. Do you know how easy it is to spend your morning just watching a giraffe drink? And then there’s always the wild goose chase like the one we went on this morning. Yesterday Calvin heard a report that a pack of wild dogs was in the area. Very rare. Once common in the Serengeti and Masai Mara, they’ve been reduced to almost nothing as a result of disease and persecution by the Masai and other tribes because they are a threat to livestock. I’ve read that even 20 years ago there were probably 500,000 wild African dogs and now there may be less that 4,000 remaining. Pound for pound African wild dogs may be the most efficient hunters in East Africa. Hunting in a pack, they pursue their victim relentlessly, handing off chase duties much the way cyclists do in a peloton until their prey is exhausted. 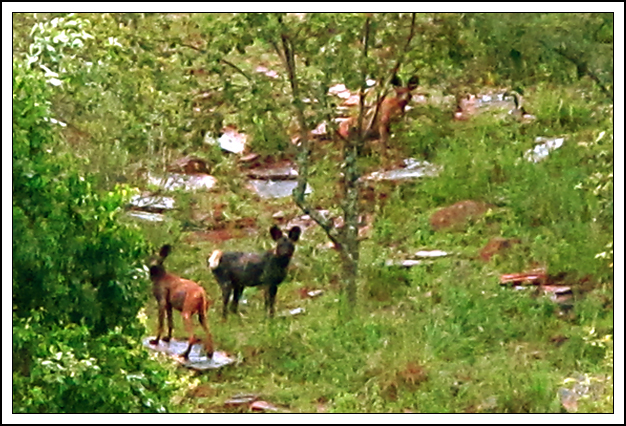 Then 20 or 30 or more wild dogs come in for the kill, dragging smaller antelopes or even a zebra to the ground. African wild dogs. Photo by Chris Mahoney. Anyway, Chris Mahoney, one of the guides at Cottars Camp, was told by the local Masai yesterday that there were some of these rare animals in the area so he spent most of the day looking for them, finally coming across 15 or 20 of them with pups in a den just before dusk. He snapped this photo of three of them with his cell phone just to show us. The quality of the pic isn’t very good but you get the idea. The thing is, wild dogs don’t stick in any one place for very long. They have an incredible hunting range that can extend for hundreds of miles and tend to hang out at one place for maybe three weeks before moving on. Which is why Calvin was rather keen to take us out looking for them early this morning (they hunt mainly at dusk and dawn and tend to hide in their dens during the heat of the day). They’re extremely elusive however, particularly around man (as they should be) and we never could find them. Not that it really mattered. Just being out in the open grassland for the morning was reward enough. 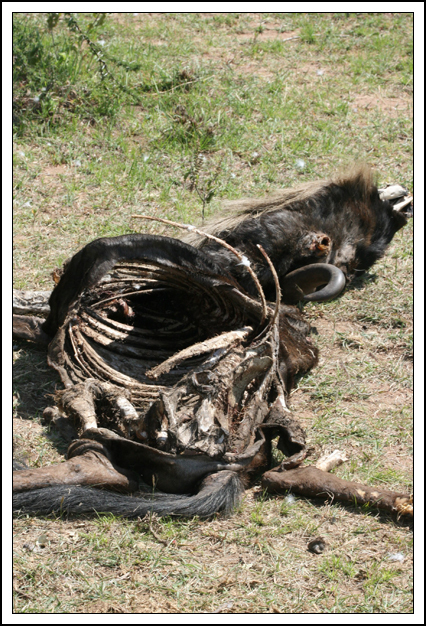 What's left of a wildebeest just a few hours after its death. Photo by David Lansing. We cut through the bush, taking a straight line to where Calvin thought the birds had landed. The lions were gone. In their place were a dozen or so vultures, huddled around a dark shapeless mass, pecking at it and each other, spreading their wings in a fury when one of their brethren dared to go for the same scrap they were after. Several maribou storks stood quietly off to the side looking like undertakers. The white-backed vulture, with his bald black head and stony stare, is an ugly bird but the maribou stork is even more hideous with its coat-like wings and back and its pink scab-encrusted head, sprouting whisps of hair, making it look like a burn victim. Just looking at these grotesque creatures gives me a chill worse than anything except maybe hyenas. We had to practically drive over the kill before the vultures would abandon it. What they’d been picking over were the remains of a small wildebeest—probably an adolescent. Calvin figured it had been killed last night because although there was very little left to be picked over, even by the vultures, there were still a few morsels of red flesh above the hoofs and inside the vacant eye sockets (the eyes being a particularly prized delicacy by the carnivores). Still, if you take a good look at this photo, it’s amazing how picked over this animal had been in probably four or five hours. First the lions had their fill, feasting, in particular, on the organs. Then the hyenas came along, maybe even chasing off the lions at one point, and quickly devouring entrails, crunching up ribs and leg bones, tearing off the snout. Which is when the vultures come in for clean-up, basically scrubbing the hide and bones clean, picking at the head and anything left on the bony legs. Eventually the marabou storks would elbow their way in and fight for anything that was left, leaving the ants and flies and other insects to dispose of hair and hide. If we came back tomorrow, all we’d probably find would be a few bleached bones and perhaps a skull. That’s how quickly Mother Nature disposes of the dead in Africa. These buffs probably can't see us but they can smell us. Photos by David Lansing. It was a Cape buffalo, of course, that ended the short happy life of Francis Macomber in Ernest Hemingway’s classic short story of the same name. After we left the cheetahs, we drove up a slight rise and across a grassy plain inhabited by zebras and wildebeests with the odd Thomsons gazelle mixed in as well. The dry grass was waist-high making it difficult for Calvin to know where to go so Hardy climbed up on the roof and gave him directions to avoid wart-hog holes and hidden boulders. Still, every once in awhile, the bottom of the Land Cruiser would scrape over an unseen hazard and Calvin would curse under his breath. Calvin stopped the car and studied the grass around us, pointing at it and saying, “There.” I couldn’t see what he was pointing at. It just looked like more dry grass and a couple of smallish termite mounds to me. Calvin got his field glasses and studied the slope in front of us. Buffalos trying to get our scent to see if we're dangerous or not. I asked him what he was seeing. He put down the field glasses and looked at the grass again. “You see how it’s shorter?” he said. And now that he’d pointed it out, I could. The grass we’d driven through was at least three feet high and the area he was pointing at was a foot high at most. But I didn’t know what that meant. And they were. About fifty or so. Mostly females and their off-spring (the bulls tend to form their own sub-herds around the cows). 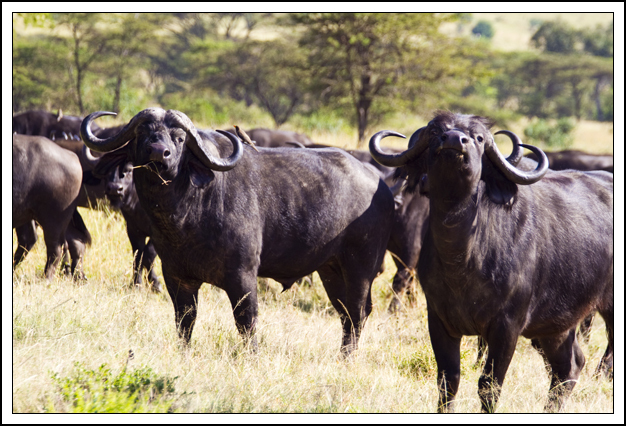 Buffalos can’t see worth a damn and their hearing is poor but they can smell a lion—or a human—at a great distance. And spook easily. Which makes it extremely difficult to sneak up on them. Calvin got us as close as he thought possible and then stopped the vehicle and we just sat looking at each other, the herd of buffs and us. Calvin said from this distance they couldn’t make us out. We were just a dark boxy shape to them. So they weren’t quite sure if we were dangerous or not. Which is why they had their heads up and were sniffing the air. Trying to get our scent. This lasted for three or four minutes. And then they decided, for whatever reason, that they’d had enough of us. And thundered off, their thousand-pound bodies rushing through the high grass like a fullback trying to pick up a first down, while the Land Cruiser gently shook as if from a small earthquake. Mom grooms one of her youngsters. Photos by David Lansing. The cheetahs were moving away from us across the top of a rocky ridge, their movements effortless and graceful. Once we crossed the donga and started climbing up the hill, very, very slowly, the cheetahs became aware of our presence. We were still a good quarter mile or more away. All you could see was a slight movement in the high grass and every once in awhile the glimpse of a sleek, spotted body slinking away. Calvin figured it was a mother and her two adolescent children. We started to play a little game with the cheetahs. Calvin would stop the Land Cruiser, kill the engine, and we’d let the cats have a good look at us before starting up again and approaching a little closer, at which point the cheetahs would slink further across the ridge as we followed. Doing this in steps, we eventually closed the distance between us from a quarter of a mile to maybe a hundred feet. This took us about half an hour. 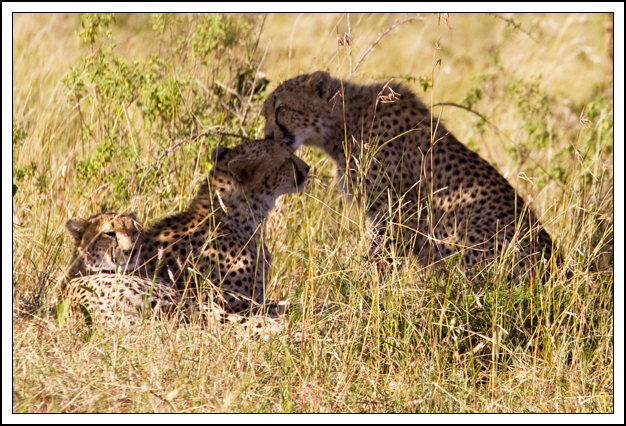 At this point the cheetahs were slouched in the shade of a thorn bush with a view of the sloping hill in front of them. I had always thought that cats stalk their kill from a great distance, slowly sneaking up on it until it’s time for the chase, but Calvin said usually they find a good place from which to attack—like a covered area on top of a ridge—and let their prey come to them. Much more efficient. This was obviously what the cheetah family was doing. All the shadowy coolness of morning was gone now, replaced by the harsh heat of day. Calvin positioned the Land Cruiser to give us as much shade as possible. Even so, it was starting to get hot. We didn’t talk. 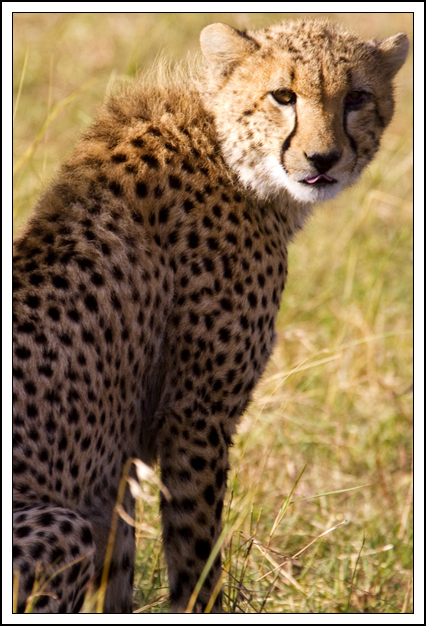 I’d screwed a mono-pod on to the base of my camera and was using a 200mm telephoto lens with a 2X multiplier and when I looked through my camera, I could see the amber eyes of one of the largest of the cheetahs, the mother, and a pink slip of tongue sticking out. She was beautiful to look at and seemed to be staring right back at me. There was a cooler in the rear and Fletch got out very cold cans of Tusker beer and handed them around to everyone but Hardy. He had to pee but knew he couldn’t get out of the vehicle. Calvin asked him if we should drive away and find someplace where he could do his business but Hardy said no, this was just too amazing, he’d pee in a bottle if it got bad. Just then the three cheetahs exploded in a furious run right in front of us. A lone eland had wandered by and the cats, led by mom, went after it. 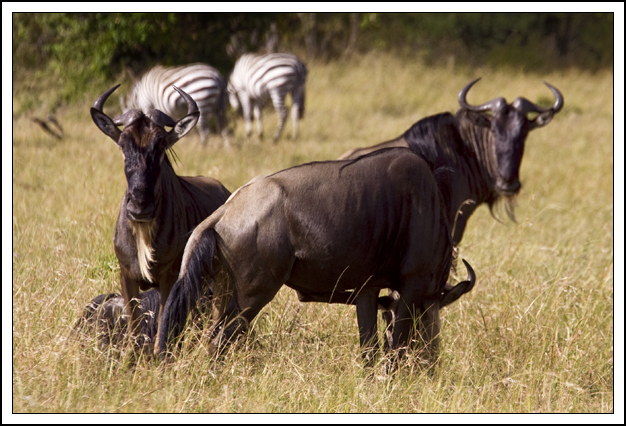 An eland isn’t typical prey for cheetahs. The largest of African antelope, they’re about the size of cattle, which they somewhat resemble. Several cheetahs could obviously bring one down, but it wouldn’t be easy. The eland changed course, heading down the hill instead of up, the minute the cheetahs attacked. Before I could even swing my camera around, they’d moved off to our left, heading for the donga. The largest of the cheetahs made a swipe at the eland’s back legs to knock it off its feet but missed and the eland changed directions once again. Already the two smaller cheetahs had stopped running and were falling behind. Soon the mother gave up as well and the eland fled down into the donga. Cheetahs are very fast but they have no stamina. They can run over 60 mph but only for short distances. And after a sprint, they need to chill out for at least half-an-hour before making another attempt. Calvin knew nothing exciting would be happening for awhile so he backed the Land Cruiser up and slowly drove away from the cheetahs, looking for a spot where we could safely get out and stretch our legs or whatever for a few minutes. Then we went back to look for the cheetahs. They were lying on their sides in the shade, the mother grooming her two children. Calvin said he thought the cats looked a little thin. “They need a meal,” he said. Pete and I took photos of them for another half hour or so, hoping that a small Thomsons gazelle or maybe a dik-dik would come by, something a little easier for the cheetahs to run down, but, like all cats, they are patient. It might be another hour before they gave chase again or it might be another five hours. Who could say? We’d already stayed with the cheetahs for a couple of hours. And hadn’t we originally thought we were going to spend the morning looking for Cape buffalos? So Calvin started up the engine and with the cheetahs sitting up watching us, we slowly retreated from the ridge, in search of buffs down in the wooded glen a mile or so away. Every evening before retiring to our tents, Calvin says, “What would you boys like to do tomorrow?” and then before we can answer, he says, “I thought perhaps we’d…” and then he maps out an extremely appealing itinerary that we all enthusiastically agree to although we’ve learned by now that almost nothing that is proposed in the evening ever comes to pass the next day, which is just as well because what does happen is always superior to the original plan. So none of us were too surprised this morning when, just as the sun came up, we headed off in a Land Cruiser in search of Cape buffalos and instead spent several hours with a family of cheetahs who were out hunting. Calvin had stopped the vehicle on a bit of high ground overlooking a wide donga. The hills were brown with grass three or four feet high. 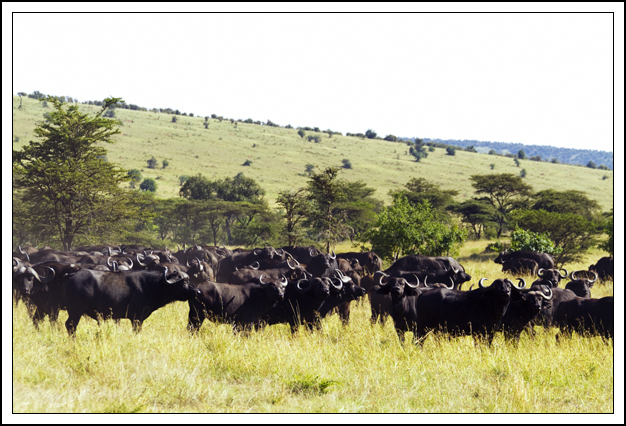 Below that was a long stand of acacias and thick green shrub—a likely spot for feeding buffalos. Calvin was scanning the area around the donga when something caught his eye, high up on the grassy hill across from us. He handed me the glasses and told me where to look, just above an outcropping of boulders at least a mile away, but I saw nothing. Cautious zebra waiting to see what we're up to. Photos by David Lansing. We cut through the high grass, moving slowly, keeping to the right of where Calvin had seen the cheetahs, crashing through thorny bushes and sinking into the occasional unseen warthog hole. The sun had just come up over the hills and that lovely cool feeling from the morning was gone, replaced by the still heat of the sun rising up over the Rift Valley. There was no breeze, which made it easier to move through the high grass without disturbing the herds of zebra and wildbeest feeding all around us. 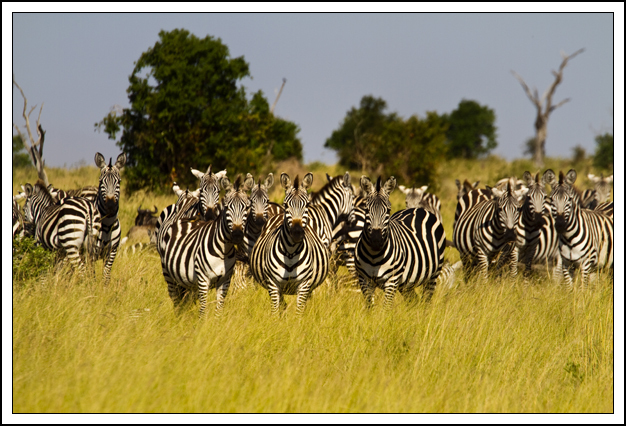 Sometimes we’d catch the notice of some zebra but at best they’d just stop their feeding, turn to face us, their heads up, ears alert, waiting for us to slowly pass on before going back to their grazing. Wildebeest just waiting for someone to come by and eat them. 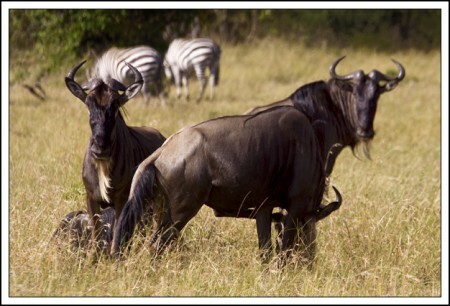 The ones you had to worry about spooking were the wildebeest. Because they are senseless creatures. If you believe in reincarnation and think that it is possible you might come back as an animal, pray that it is not as a wildbeest for they are the Paris Hiltons of the plains. It is as if they all have mad cow disease or are manic-depressive. They’ll swing their hips around and chase their tails, bucking crazily like an untamed horse and scatter to the four winds for no reason other than they momentarily felt giddy or perhaps a fly was on their shoulder. The next minute, they’ll look dumbly on, staying stock still, as a pride of lions slouches towards them. They have powerful hind legs that, with a kick, could easily kill just about any beast, and curled horns sharper than knives that could shred raw flesh like a sushi chef yet it’s not unusual for them to stand idly by, looking almost bored, while a lion or some other beast eviscerates them, their guts and life spilling out from them with no fight at all until they simply fall over, already dead. It’s like they are the walking buffet meal of the African plains and they know it. Their primary defensive strategy, when being stalked, is to move to the center of the herd. But, of course, not everyone can move to the center of the herd. Or there would be no center. But they haven’t quite figured that out yet. Maybe in another three million years.